No, PixelJunk SideScroller is not old-school. Nor is it retro -- OK, maybe a little. But, more than that, it’s a completely contemporary game full of visuals and ideas that feel fresh and original within videogame’s oldest genre: the shooter. 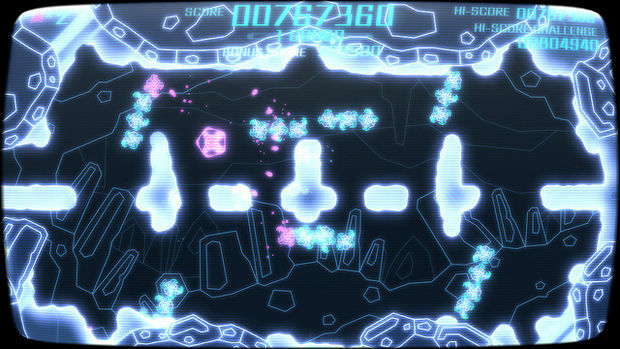 Considering SideScroller is based on the framework of a bonus stage (“Road to Dawn” in PixelJunk Shooter 2) and the most genre-defined game in the PixelJunk series, Q-Games latest PS3 downloadable can be easily mistaken as a stop-gap between projects or proof that the developer is taking too many psychedelics (see: PixelJunk 4am). Whether this is the case or not, SideScroller is one of the most visually exciting and fun games to be released this year. 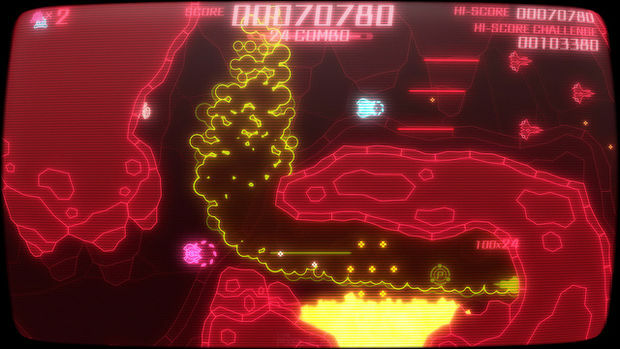 If you beat PixelJunk Shooter 2 and played the unlockable sidescrolling shmup stage, like a tru3 hxcorez dude, then you know SideScroller is a labor of love for Q-Games. SideScroller is more than just an expansion on that idea. It’s the developer’s best game yet. From beginning to end, SideScroller is an immaculately polished, trippy adventure back into the heart of what made a good shooter in the ‘90s. Don’t worry, there are also unlockable difficulty modes and online leaderboards for fans of modern shmups. Like Salamander and Harmful Park, SideScroller gives the player access to a versatile arsenal at all times. The machine gun is self-explanatory. It’s a bit weak, which makes it only useful for the beginning of levels. Then there is the laser and wall gun. The laser is essential for dealing damage fast and the wall guns will help you deal with turrets and other enemies clinging to the walls, above and below. You can level each weapon up to five times (a la Harmful Park), extending their range and power. Finally, there is the charge attack which, as far as I can tell, is completely useless. You hold down the L1 trigger to power-up a charge that sends you spiralling in the direction of your choice. It feels like a half-baked idea that Q-Games never fully developed. We’ll see if high score YouTube videos prove me wrong. The weapon system constantly puts you to the test, as enemies and environments force you to adjust your strategy. Despite the cliché weapon-types, the way Q-Games implemented the system is completely unique and exciting. The challenge grows immensely after the opening stage. (Confusingly, the game has three “stages” that contain four sectors each.) If you don’t know what weapons are good for which environments, you’ll soon find yourself accepting the game’s invitation to play on Casual Mode. As I was saying, Q-Games have done an immaculate job of making every level feel unique through its layouts, mini-bosses, hectic finales, and environmental obstacles. 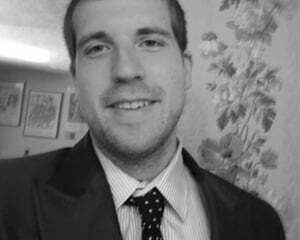 Your ship will weather the elements, although to a lesser extent than the Shooter games. There are no puzzles to be solved here, but lava, gas clouds, and other colorful substances (that I can’t quite identify) make for an ingenious way to restrict the player’s movement. At one point, I cleared a wave of enemies and suddenly found myself searching for safety as a tidal wave of red, boiling death came flowing my way. This game is pretty intense, so feel no shame in punching your pillow, biting your tongue, and letting out a breath of relief as you approach a checkpoint. We all do it. Especially on Hard mode. Along with Casual Mode (...) and Normal Mode, you’ll unlock Hard and Burtal after that. Each difficulty level feels like it was examined in detail, as enemies and environmental hazards are tailored toward each play-level. Even better, Hard mode has an awesome graphics filter that makes the game look like what we thought future Game Boys would look like in 1992. 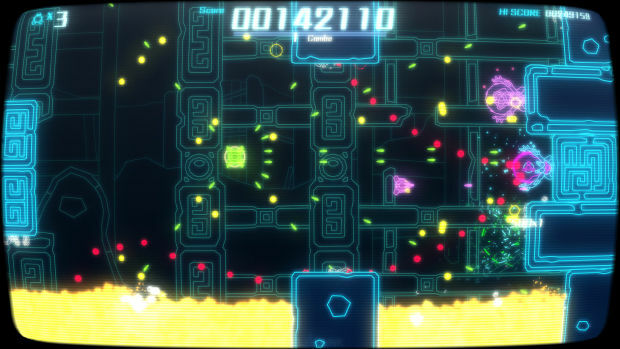 Along with having a less exciting greyscale filter, Brutal mode gives enemies suicide bullets and bullet patterns that flirt with Danmaku. Unlike most shmups, SideScroller doesn’t connect levels together. Each level is played for its own score, so a 1cc isn’t really possible with this game. On the other hand, the combo system and hidden bonuses should keep the dedicated genre-fans returning. Everything in the game, including the bullet patterns, is pretty simple but the game never feels dumbed-down. The weapon system and fluid hazards even out the challenge. However, the checkpoint system may kill it. You basically have infinite continues and you respawn at your last checkpoint. 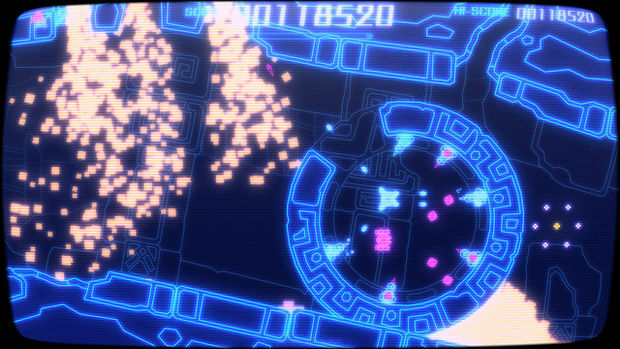 It may be a bit too Call of Duty for shmup-purists, but you’ll be thankful for this in later stages. The visuals in SideScroller are the next best thing to dropping acid at a Daft Punk concert. The scanlines and warped corners of the screen, that replicate a CRT TV, are a loving ode to the '90s, but the actual graphics are jaw-dropping. I thought past Q-Games titles looked like boring Illustrator images made by an ad company, but this game is something entirely different. The way the neon-glow and color palate mix is incredible. I had so much fun getting to the next level just to see how it looked and I was never disappointed. 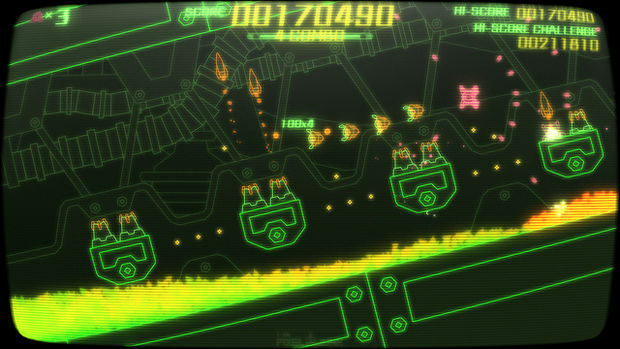 I only wish the game were in 3D, since the game’s scrolling parallax layers naturally pop-out at you due to the colors. The entirety of the final sector, which can only be unlocked via Normal Mode, is one of the most memorable moments of gaming this year. Much like Rez, SideScroller saves the best for last with this epic, mind-bending stage. I’ve never seen graphical glitches so creatively used for tension and visual effect like this before. It’s a brilliant moment when the game’s aesthetic and gameplay come together to make something incredible. I just wish the entire game could have been on this level. Touhou and Cave fans may find issue with SideScroller’s slower-pace and constant checkpoints -- not to mention the levels have individual scores -- but this is a rare shooter that will have appeal to a wide audience. Stoners, hi-score chasers, and shmup veterans will all find something to love in Q-Games' latest. 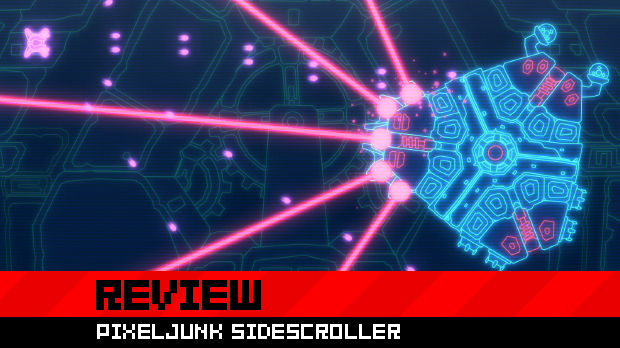 Along with Deathsmiles and Gradius V, SideScroller is one of the few side-scrolling gems of the past decade. So long and thanks for all the bullets, Q-Games.